Oh, what a great feeling it is to have new tires. We all love that 'new tire' feeling, but it's important to keep up with the maintenance long after you've slapped those babies on your ride. The next step may be to upgrade that rusty old tire pressure gauge, or if you want to the convenience you can get a tire pressure monitor. If you're like me, you're also stinging from price tag of new tires, even discount tires will thin your wallet out nicely. So how do we get the most out of our new tires? There are many ways, but tire pressure is among the biggest. Keeping your tires at the proper pressure has good economic benefits. Some say that maintaining proper tire pressure is as advantageous to gas mileage as a tune up. With gas prices as high as they are, we could all use a little break. Keeping proper air pressure in your tires will make them last longer too. The tires will wear evenly, last longer, and again... you'll save on fuel. Of course, you'll also benefit from a safer ride because your car will handle better. Maintaining correct air pressure in your tires allows them to wear evenly,last longer and even save fuel. If you consider the other side of this equation:premature wear, poor handling, poor gas mileage and even loss of control due touneven wear, it's not difficult to see the value in routinely checking andmaintaining proper air pressure in your wheels. Recently I made a trip to Pep Boys and found myself wandering the isles. I figured I'd pick up an new tire pressure gauge since my teenage son 'borrowed' mine. Let me tell you, tire pressure gauges have come a long way. 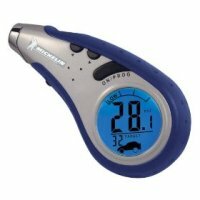 If you haven't been checking your tire pressure regularly, go pick up one of these cool gauges. They'll make it easier and your friends will dig the new gadget in your ash tray. In general, tires will lose as much as two pounds of pressure each month during cool seasons, and more in warmer weather. Unless you went with a tire pressure monitor, you'll have to get down there and check every couple weeks or so. Find a regular routine that will help you check your pressure consistently. Some people check when they pump their gas, others when they wash their car. It's also a good idea to have the pressure checked when you're having your tires rotated. You are also advised to check tire pressure when the tire is cold, or less than a mile of driving before checking. Warm tires will have a higher pressure. Oh, and don't forget about the spare. What pressure should you use? Look for the proper pressure in your manual or in the tire placard (the placard is typically in the door edge or fuel door). You can also make a quick call to the a local tire store. If you find your tire pressure going down more than normal, be sure to get to the tire store to have them checked. Make sure you have a tire pressure gauge that measures in 2 psi increments. Learn some insider tips and tricks of car detailing from Expert Mobile Car Detailing of Southern California. Learn the best auto detailing tips to simplify your efforts of cosmetic car care.